In this world, there are always many different kinds of world’s firsts — which is a claim to fame. It is like a hallmark for an organization or something to be proud of. Deepoon is proud to announce that they have revealed the first all-in-one VR headset in the world, calling it the Deepoon M2. This standalone virtual reality headset started to ship from the end of last month, and have managed to pick up more than 20,000 orders for the Deepoon M2 alone since it went on pre-sale from the beginning of April this year onward. The Deepoon M2 is a milestone that has never before seen in the history of China’s virtual reality headset industry, which makes this achievement all the more interesting. The Deepoon M2 comes across as an independent system and boasts of computing capability, a long battery life, an OLED display from Samsung as well as the same powerful Samsung Exynos 7420 chipset which sees action in the Samsung Galaxy S6 family of smartphones. Not only that, there is also technological support from Samsung Semiconductor and ARM, making the Deepoon M2 rivals the best in class in VR products. 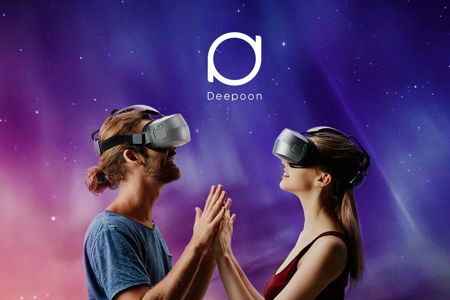 Thanks to support from ARM, the world’s leading semiconductor intellectual property(IP) supplier, Deepoon holds the distinction of being the first Chinese VR maker to roll out a solution for mobile processor VR specific optimizations, where it includes front buffering, context priority, and multi-view in order to ensure top GPU performance for VR games as well as minimal power consumption even when in high graphic computing, thus further lowering the possibility of atomization. In addition, Deepoon has worked closely with ARM in order to optimize for rendering by Mali GPU and integrate some key algorithms such as asynchronous time warp (ATW). This will allow it to control latency to within 19ms and deliver no faintness for users. There are more than 150 entire VR games for you to download, where it includes some top mobile VR games, such as Mummy Hunter, James Legacy, and 10,000+ hours of genuine video content. This is a truly all-in-one VR Headset which can deliver complete freedom in the virtual world and allows users feel no constraint from reality.